Note: This snack has been discontinued by the manufacturer. Taste test: These are good tortilla chips. They've got lots of corn taste, without too much salt, and the chips are fairly big and good for dipping. I've never had any bagged "restaurant style" tortilla chips that were actually as good as the ones that they make fresh in Mexican restaurants (these really aren't anything like those) but these are good bagged chips. 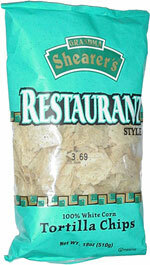 Smell test: Good corn chips smell.